"I just wanted to say thanks so much for playing at our wedding! We all had a fantastic time and even my English relatives loved it (although some of them were TERRIBLE at the dancing!!). Everyone has commented on how great you were, and one of the hotel workers said she thought it was the best entertainment she had seen in her 8 years at Matfen Hall!! "Just wanted to say a massive thank you for doing such a fabulous job on our wedding day. Everyone had a complete ball during the ceilidh, people are still talking about it now. You were so professional, good humoured and fun all the way through-it really was perfect!" "Thanks a million from Robin and I!! We were both thoroughly impressed with your band and our friends have been leaving lots of lovely messages saying the very same. You really helped to make it an excellent evening that everyone enjoyed and left us with lots of lovely memories!" "Thank you so much for making our evening so memorable, everybody has come away saying what a fantastic time they had :). Thank you for putting up with so many people who couldn't ceilidh and yet continuing to keep everybody up and dancing you were brilliant!!" "Kirsty and I just wanted to thank you, Michael and James for doing such a brilliant job at our wedding in September. You guys did an amazing job getting everyone involved, playing very infectious music, spicing up some of the dances and expertly guiding us through them. Even Kirsty's Italian family loved the dancing! We had an amazing day as did everyone else. Thank you very much." "I just wanted to say a huge thank you for making our joint birthday party go with a swing in so many ways. The feedback from those who were up dancing has been that you were wonderful and so talented. I loved the Russian dance –that was an inspired choice. The mix of music lent an air of romance to the evening and it was just the atmosphere I wanted to create. Thanks again for all your help." "a huge thank you for the brilliant ceilidh you did for us on Saturday, we enjoyed it hugely and your music was just wonderful - great arrangements, fantastic playing and really good calling so that the English contingent knew what we were doing. Your manner with everyone was friendly and fun and made for a great party - the three of you are fab. 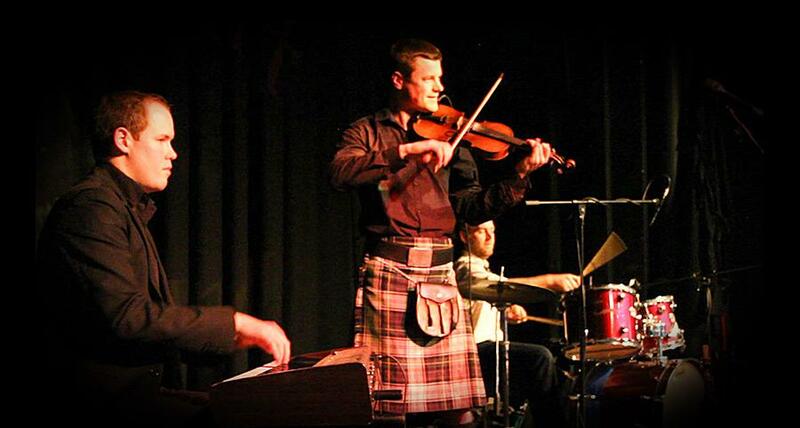 A talented young, modern ceilidh band with a lot of fresh ideas. So thanks again and I wish you every success." "That was brilliant! Never in all this world could you imagine doing the Gay Gordons….to the teddy bears picnic….and it working!!!! Sublimely talented, extremely entertaining and after experiencing this first hand you have to be the most original and exciting ceilidh band around. and it was in Greenlaw!!! Thankyou. please be aware.….WE WANT YOU BACK......"
"Thank you all so much for playing at our Ceilidh. Everyone agreed it was a fantastic success - and that was mostly due to you three and your great band - live music just makes it! You were also brilliant at judging the people there and getting all the young ones especially to dance. It was a lovely sight to see so many people having such a good time." "Yoohoo definitely made the party swing and many people have been most complimentary. Your easy-going style, ability to play both jazz and rocking ceilidh music were just fantastic. You made our party very special." "Just another huge thank you for your fantastic performance last night. You really did make the ball the success that it was. It was great that you were so completely interactive with the guests, teaching new dances which made a nice change from all the traditional ones. The jazz peices were also fantastic. I really couldn't be happier with the performance and will recommend you to any one." "We had a wonderful night, so many friends said they loved the music. "My night was really fantastic! Thanks again for a fabby evening on the 18th you all, Laura, Mike and Knowli were BRILLIANT!"